Blue Carbon Blog: Sea Otter Carbon? According to a recent North American study, sea otters can help mitigate Climate Change, through their role as the natural stewards of kelp forests. The Sea Otters help keep the number of kelp munching sea urchins down, allowing the forests are to absorb up to 12 times more carbon dioxide than when the plants aren't protected from the urchins. The study was led by researchers from the University of Southern California, Santa Cruz. 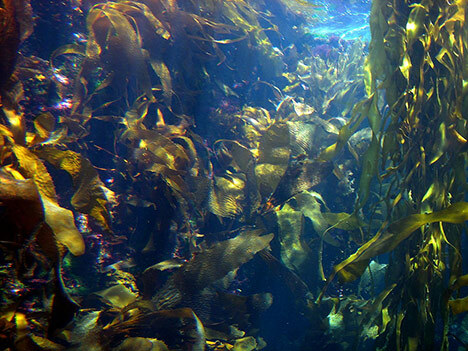 In a ScienceDaily article the aurhor's estimate that the CO2 removed from the atmosphere via the otter-kelp link could be worth between $205 million and $408 million on the European Carbon Exchange. 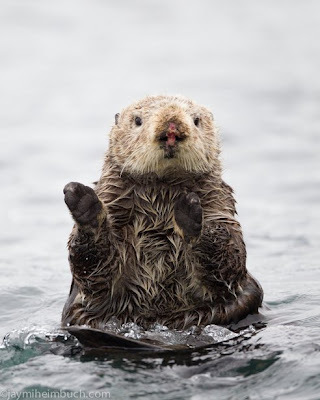 "An alluring idea," they write, would be to sell the carbon indirectly sequestered by the sea otter protected kelp forest "as a way to pay for their reintroduction and management or to compensate losses to shell fisheries from sea otter predation." According to Discovery News, Chris Wilmers, a co-author of the study, issued a statement that included a call to for the contributions of animals to be included in methods of sequestering carbon. The study's abstract states "predator-induced trophic cascades likely influence the rates of C flux and storage in many other species and ecosystems." According to a new study by researchers from the University of California, Santa Cruz, sea otters play an important role in helping the coastal seaweed forests absorb as much carbon dioxide as possible. The little furry creatures are natural predators to sea urchins, which in turn like to munch on kelp, a very common family of large seaweeds. According to the study, which looked at 40 years of data on sea otters and kelp blooms from Vancouver Island to the western edge of Alaska's Aleutian Islands, when sea otters are around, underwater kelp forests can absorb 12 times more carbon dioxide than when the plants aren't protected from urchins (those spikey little devils!). The authors acknowledge that otters probably aren't the answer to rising CO2 levels, a major contributing factor to global warming, but the researchers say their study illustrates the impact animals can have on the atmosphere. That's a very good point. For our climate models to be more accurate, the impact of various animal populations should be accounted for (as much as possible), and this could even give more weight to the argument for conservation and the reintroduction of animals in certain ecosystems. Sea otters in themselves might not have the biggest impact on the carbon cycle, but I'm sure there are many other species that do similar things, and when you add all of them together, you probably get a pretty big impact. Besides, who doesn't love sea otters?